Good morning! I am back with a quick post for today... I had a chance to play with one of Taylor's newest sets, Wings of Joy. I used her latest sketch, TESC86. 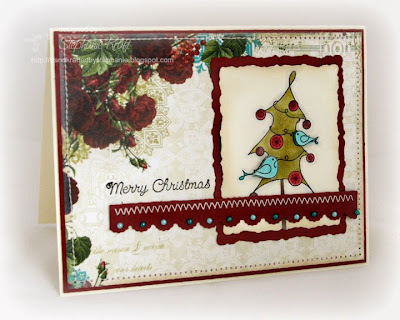 I stamped the tree image once, colored it, then I stamped it a second time and cut out the little birdies and popped them on top for a little dimension. After coloring the ornaments, I went over them with my clear Spica glitter pen, and finally I sprayed my image panel with Iridescent Gold Glimmer Mist and inked the edges. This also will be my card for Sparkle's Christmas Card Challenge Week #45 which is to make a card with a bird on it! Enjoy the rest of the weekend! Thanks so much for stopping by! Accessories: Deckled Rectangles Nestabilities (Spellbinders), Scalloped Scallop border punch (EK Success), Markers, Clear Spica glitter pen (Copic), Pearls (Basic Grey), Iridescent Gold Glimmer Mist (Tattered Angels), Foam tape, Thread, Sewing machine. This is gorgeous! Love the bling and the stitching! This is gorgeous! What a cute stamp set! Great card--I really like that you added the stitching! This is such a darling set--so many cute images! So cool to see this whimsical tree with that beautiful elegant paper! What a great card... love the paper, the coloring... nice job on the sketch. TFS!